The Green Valley Grammar School has a history which features several pioneer Danville families. The first school was built in 1865 by the Howard brothers on land owned by Andrew Inman. Many of the students who attended came from the large Noia family. Before the school was built, classes had been taught in a room at White Gate Farm, owned by brothers Nathanial and Charles Howard who had immigrated to California in 1849 and built White Gate in 1856. Nathaniel was an architect and builder and, with his brother, built several other houses in Danville. Andrew and Daniel Inman came to California’s gold country in 1949 and began buying Danville land in 1852. Andrew stayed to ranch in Green Valley, while Daniel returned to mine. When Daniel bought a farm on both sides of San Ramon Creek in 1858, that area became the village of Danville. The school was said to be the county’s first plastered school and cost the princely amount of $575. One newspaper reported that it was the third most valuable school facility in the county. There was also a barn and water was pumped from wells which were 5 feet across and 20 feet deep. It was located on the NW corner of today’s Green Valley and Blemer Roads. Enrollment in the mid-1860s was 24. Early teachers Clara Germain and Hattie G. Clark were paid $58 a month. Amelia recalled many school and family picnics at the Uriel Huntington ranch near Mt. Diablo’s foothills which was full of mature trees. Fundraisers were held for the school in the village. An Contra Costa Gazette article (11-8-1879) said “Green Valley School will give a Public Exhibition at the Danville Grange Hall Friday evening November 21st – Proceeds for purchase of a school organ.” Admission was 50 cents. Photographs of the school and students include several Noia children. This family lived on a ranch (today’s Magee Homes on Blackhawk Road) and included eleven children whose parents were Francisco and Mary Silva Noia, both Portuguese from the Azores. The children walked to school in good weather and were often brought to school in a wagon when it rained. Julia Noia Freitas recalled bringing a clean white skirt to put on at school when the road was muddy. 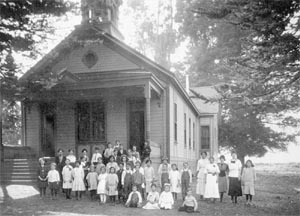 By 1920 the building was dilapidated and a new school in a mission style was built on the old site by Steve Johnson. It was dedicated in 1922 and cost $1,200. The enrollment was around 40. In 1930 voters decided to join the new Danville Elementary District and the school closed. The building was sold to Curt Haskell for the $650 taxes due. Eric and Lydia Turner purchased it in 1945 and restored it as their home. She remembered that it had a marvelous view of Mt. Diablo. The new Green Valley Elementary School was built in 1952 on Diablo Road and enlarged several times in that decade. The school bell out front is engraved with the date “1867” and reminds us of that first school for pioneer children.